Backup fast, Restore easy and Files secure! 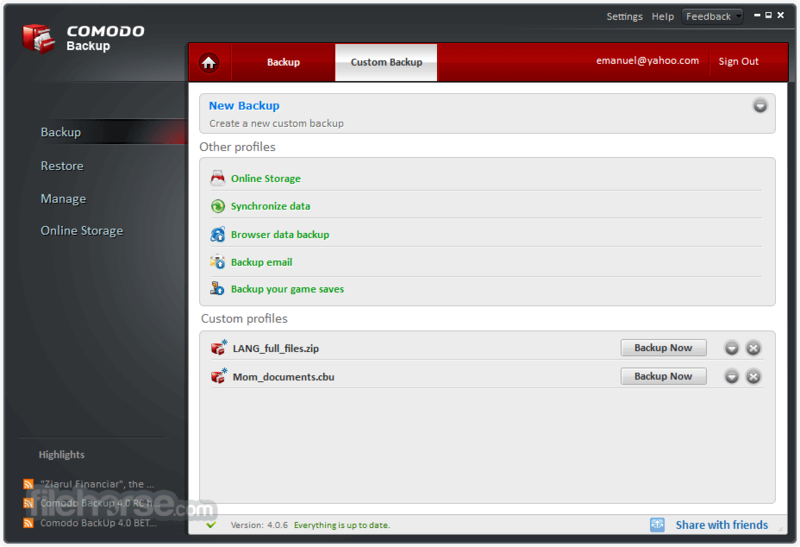 Comodo Backup is the straightforward and powerful utility that allows users to quickly and easily create backup copies of critical files. Free of charge, its features include complete file and folder duplication to local/ network drives and FTP servers, intelligent incremental backups, e-mail reporting, extensive report logs, real time back ups with 'synchronization' mode, advanced rule-based filtering, flexible scheduling of backups, space-saving archiving capabilities, and more. Easily backup files or folders anywhere on your computer, network, CD-RW or FTP server Protect yourself against ever losing those critical files that took hours to create Schedule backups to run automatically at a time that suits you Synchronized backups - you save a file and it gets copied instantly Send E-mail notifications to team members about the status of a backup job Save Disk space by compressing your backups as ZIP files Configure in minutes with intuitive interface Suitable for both beginners and network administrators alike, Comodo Backup can be set to run on Windows startup and/or as a Windows service. Comodo Backup makes it easy to be safe and secure by reducing the usually complex task of backup configuration to a few clicks of the mouse. Free Lifetime License. Download now and get a full license and updates absolutely free of charge forever. 10 GB online storage space for each user for 90 days. Access to your space is seamlessly integrated iinto the software, so you can start uploading files right away. 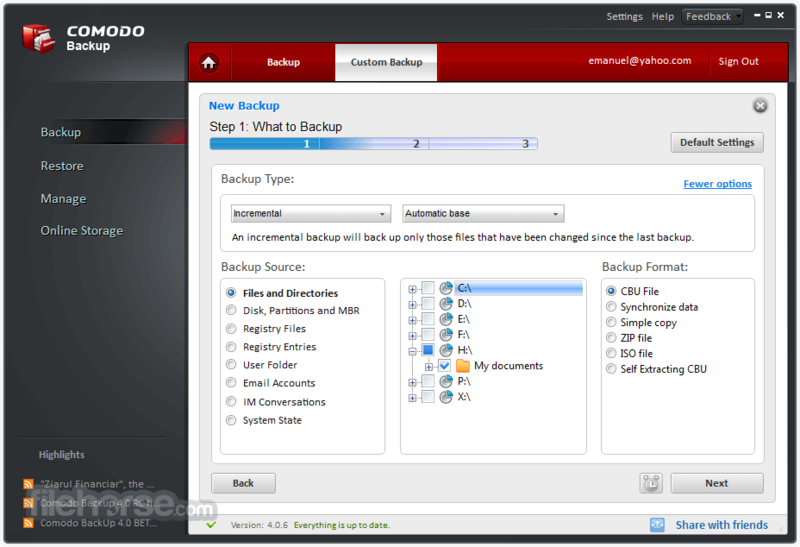 Comodo Backup's range of pre-defined profiles allow you to launch a backup task with a single click. You can also create custom profiles that best suit your needs. 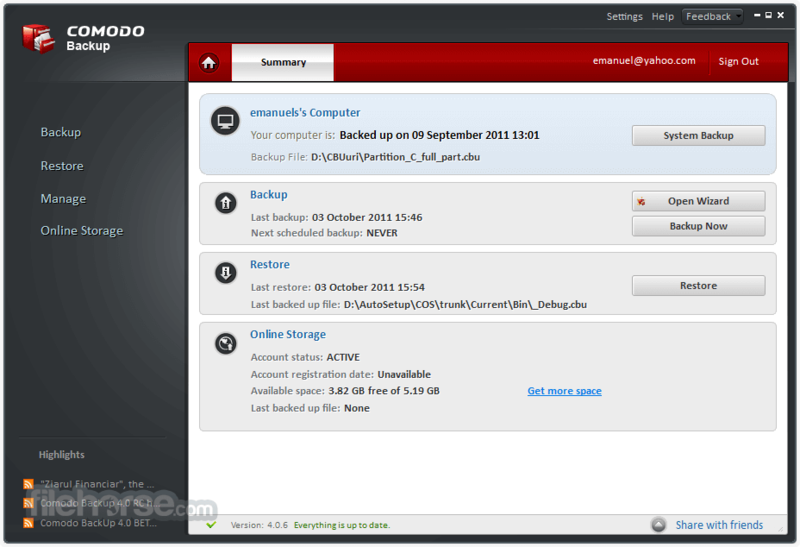 Network drive, external drive, FTP, DVD/CD, ISO, zip, online storage - you name it, Comodo Backup can copy to it! It will auto-detect and group all your documents, photos, music and videos files into a profile so you can back them up with one click. User interface makes it easy to accomplish common tasks while providing guidance and information all the way. 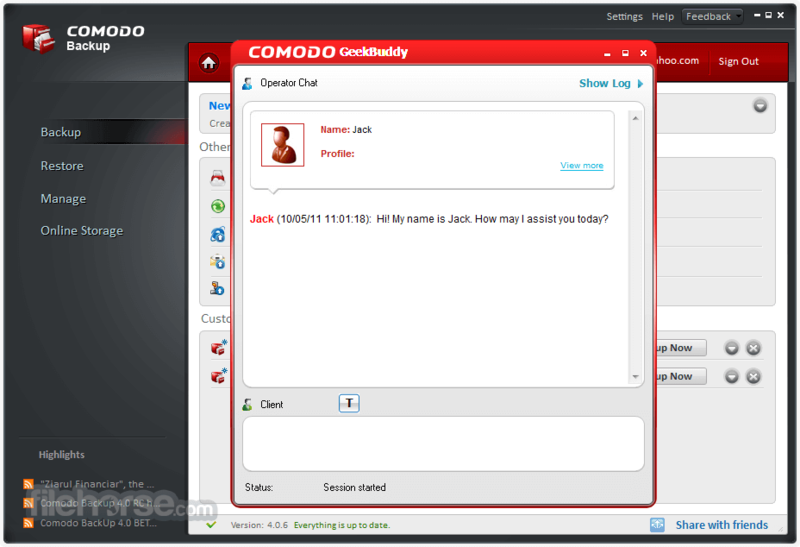 If you need help with anything, experts that know everytihng about Comodo Backup standing by round-the-clock.